Great News! Christmas wasn’t cancelled this year, all thanks to Santa’s cunning idea to use drones. Although Rudolph’s apprehensions were well-founded, drones can indeed be dangerous and misused; it is important to remember that misuse is entirely the fault of the user and not the technology, with crashes and near misses being largely reduced with thorough flying practice and by gaining a better understanding of the rules of the sky. We don’t blame the car in a car crash – especially if the driver has no license – so why do we blame the drone in a drone crash rather than the unlicensed operator? Thankfully Santa ignored these media reports and persevered with using drones, and so they were used to great effect: THEY SAVED CHRISTMAS! Never let media reports of other people’s mistakes deter you from using drone technology for a great cause. We hope that you have all enjoyed following our Rescue Drone Christmas Story. We aimed to highlight the positive impact of drones in a festive and light-hearted manner. 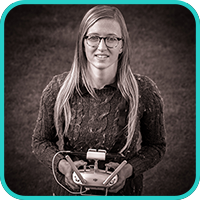 The lifesaving and truly life-changing abilities of drone technology is something we feel extremely passionate about bringing awareness to. Our Christmas Cards brought the joy of rescue drone awareness to over 50 new people, and our online Rescue Drone Christmas Story spread the message to a further 4,000 people and counting! And we, like Santa, will never give up! Drones are a force for good and we are excited to see how rescue drones evolve during 2018. We at SkyBound Rescuer wish you all a very Merry Christmas and the happiest of New Years!